The day started at about 6 am, which was about two hours before I was expecting it to start. I heard noise in the kitchen, then heard Malida talking to someone. The noise didn't abate, so I went out to see what was up. She couldn't sleep, so got up at about 4 to watch tv, and by 6 she was hungry, so was making some noodles and talking to the cats. I went back to sleep for a couple hours and got up at the appointed time. By this time she was exhausted and went back to bed, while I started doing my prep work for our thanksgiving dinner. I went out for a walk at about 10, and stopped at the store on my way home for some random vegetables that could act as a rack for my pork roast. I was in and out in less than 10 minutes. My menu wasn't complex, but required timing, so I sat down when I got home and figured it out. If I learned anything from my days as a hospital cook, it was to time everything to be done at a certain time. I'm still good at that. The roast took the longest, so I started that early. My idea was that it would finish early, and I could let it rest while I cooked the other stuff, then reverse sear it at the end, which is what I did. While the roast was cooking I prepped all the other stuff that would need to be cooked in the last hour. In the interval, I relaxed and listened to music, while Malida woke from one nap and entered another. She finally awoke refreshed around 4 and set the table, etc. Our table setting. 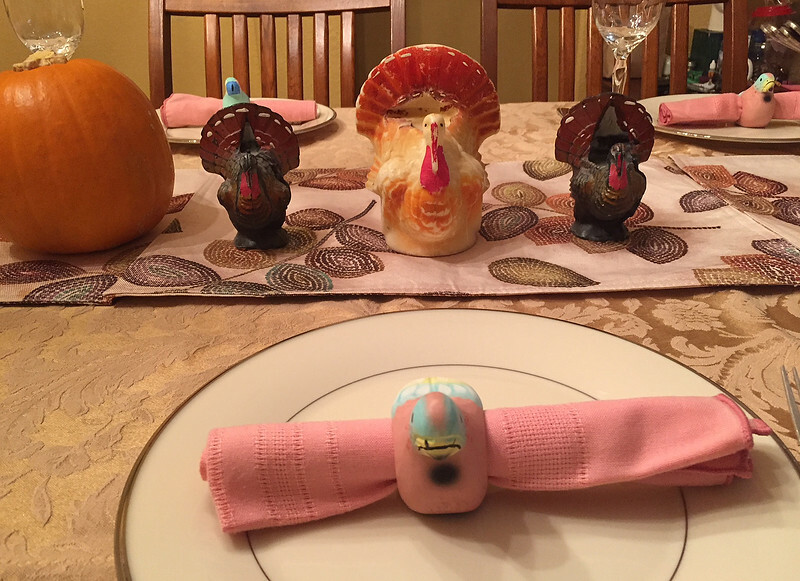 Those turkey candles are older than I am, and have graced everything Thanksgiving dinner I can remember. They were inadvertently lit one Thanksgiving by my first wife. We ended up with 7 for dinner, and had a great feast. 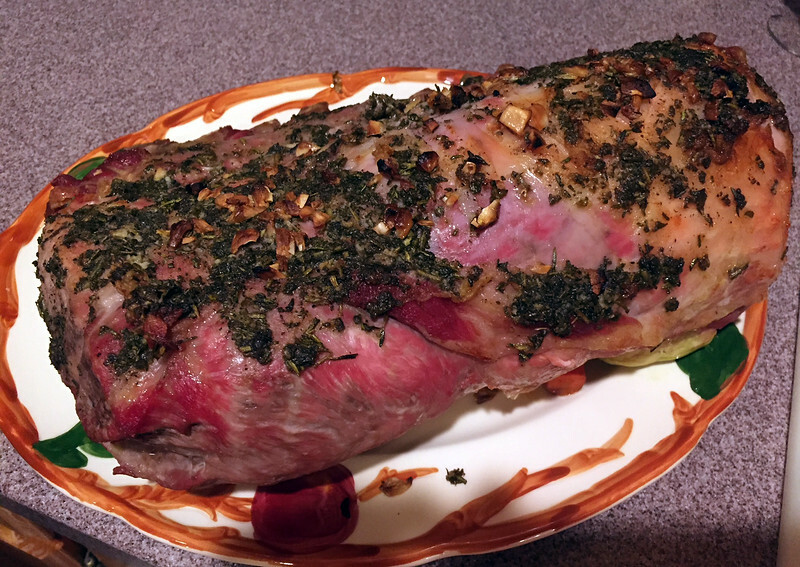 My pork roast--it turned out great. 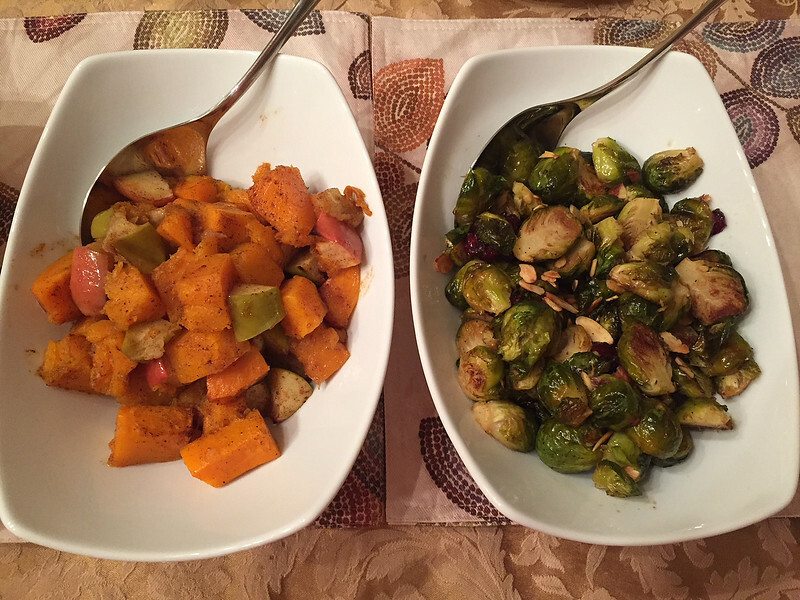 My veggies--butternut squash with apples, and Brussels sprouts with balsamic vinegar and cranberries. I had a recipe that suggested combining them, but decided not to. We sat around for a few hours after we ate and talked about all sorts of things, and no politics. It was a great evening, and I am glad it is over, lol.